QUESTION: Hello, Diabetes runs in our family, my mother and my sister having gotten it in their late fifties, I am at that age now with a fasting blood sugar level of 101. Could I take the Gymnema Sylvestre to try and stave off the disease without harmful side effects? First, your fasting blood sugar of 101, to my opinion, is not an indicator of pre-diabetes. Unless, you have other blood glucose readings and other signs that indicate pre-diabetes. Next, Gymnema Sylvestre is not used only for diabetes, but, to support also the general health. However, people with low blood sugar levels should be careful as this herb can lower it even more. - if you do not have pre-diabetes, then, you can use G.sylvestre for a short period of time (up to 6 months) to support your general health. 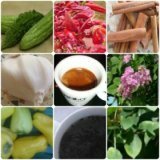 - if you are already diagnosed as a pre-diabetic by your doctor, then, you can use this herb for longer and enjoy the great results. However, keep in mind that herbs contain many components, some of which may cause undesired effects in certain individuals. Therefore, I ask you to carefully observe them and stop using it. - If you are taking any diabetic medication, please consult your doctor when you decide to go for G.sylvestre.